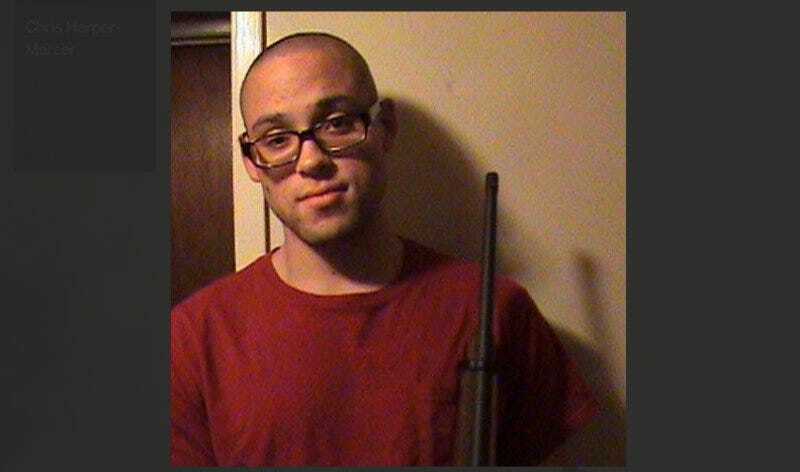 Media outlets are quickly uncovering details about Chris Harper Mercer, 26, identified last night as the shooter who killed ten people and injured seven at the Umpqua Community College in Roseburg, Oregon on Thursday. His neighbors describe him as an isolated, cranky weirdo in camo pants who frequently yelled at them, and his social media and dating profiles indicate he hated organized religion. “And they would stand up and he said, ‘Good, because you’re a Christian, you’re going to see God in just about one second,’” Boylan’‘s father, Stacy, told CNN, relaying her account. Boylan told her family that she survived by playing dead after Mercer called to her, “Hey you, blond woman,” as she lay on the ground bleeding. The New York Times says officers with the Department of Homeland Security arrived Thursday night at the apartment complex near the school where Mercer reportedly lived with his mother. Bronte Hart, a neighbor who said she lived in an apartment below Mr. Mercer’s, described a more assertive young man than his former neighbors in California did. Far from avoiding social interaction, she said, he frequently shouted at her for smoking on her balcony. According to the Times, federal investigators are looking at a 4Chan thread which may have been written by Mercer. That still hasn’t been confirmed. As authorities continue investigating, a war has broken out on a new Wikipedia page for the shooting, which someone tried repeatedly to edit last night to say that the school is a “gun-free zone.” An Oregon court ruled in 2011 that students and faculty with concealed carry permits could bring guns on community college campuses. A veteran and UCC student named John Parker Jr. gave an interview to MSNBC in which he said he was on campus at the time of the shooting carrying a concealed handgun, and implied other students with him were armed as well. The latest activity on the torrent account was a video uploaded on Tuesday, a BBC documentary about the 2012 mass shooting at Sandy Hook Elementary School in Newtown, Conn., in which 26 people — most of them children under the age of 10 — lost their lives.